Micah, please! : The coolest t-shirt ever? Yes. 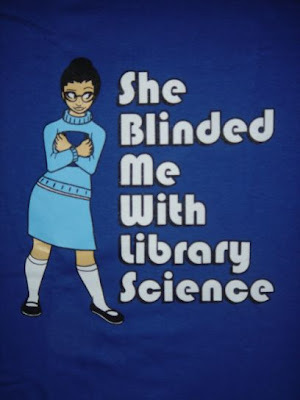 Though I'm only a casual reader of webcomic Questionable Content, I just had to buy its "She Blinded Me With Library Science" t-shirt when it was brought to my attention. It took the folks behind the comic/merch site over 2 months to actually fulfill my order (just in time for winter! ), but it was well worth the wait. Is there anything wrong with wearing my fetish* on my (short) sleeve? *Well, one of my fetishes. In a very, very blue mood this last week (just now coming out of) and read some 300+ of those comix, man. in two days. Wow. I've only read a couple of dozen and I've been "following" it for months now. I keep forgetting to check it. Glad you're coming out of your funk.